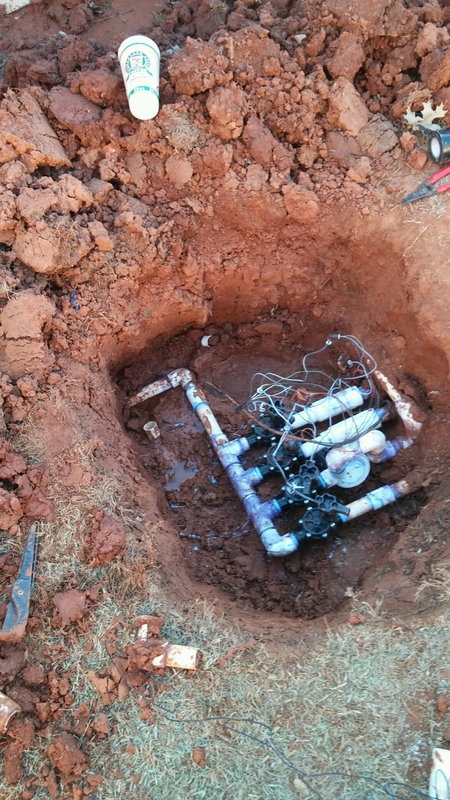 Today we did a sprinkler repair in Norman. The sprinkler system needed a checkup. We went through each sprinkler zone and identified several different problems. Zone 2 had a cracked sprinkler pipe in a flower bed. Zone 4 had a broken sprinkler rotor on the edge of the driveway that had been driven over and broken. Zone 6 and 7 each had a couple of pop-up spray heads that were worn out and would not pop-up. The diagnosis and the repair took less than two hours. Now their sprinkler system is running great! 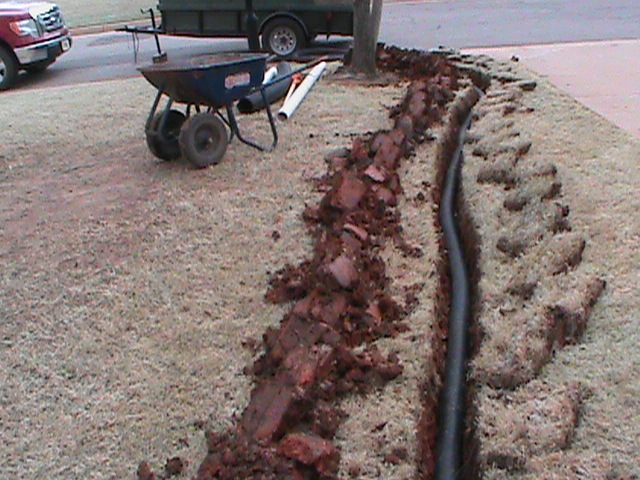 Tomorrow, we are going to Edmond to install a French Drain. Hopefully 2012 wont be as hot as 2011. Record heat for Central Oklahoma caused the death of trees, shrubs, and grass all over the state. A new Lawn Irrigation System installed by CMG can help solve these problems. Sprinkler Systems distribute water much faster and more efficiently than dragging hoses around all day to water your yard. Our Sprinkler Systems are Self-Draing. The Sprinkler Pipes Drain underground when the Irrigation System is turned off. 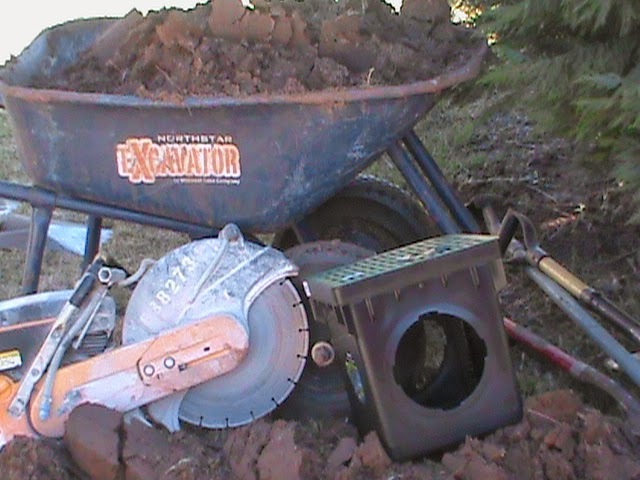 Nothing needs to be done to prepare your Irrigation System for winter except turn it off. There is no water left in the Sprinkler Pipes to Freeze when it gets cold in the winter. The above are the most common sprinkler problems that we deal with. CMG Sprinklers and Drains – can help if you need to re-design your sprinkler system. If for example you are adding a swimming pool in your back yard, we can move the sprinkler heads and sprinkler pipesto fit the new dimensions of your yard. We can redesign or add-on to sprinkler systemswhere the home owners needs change. 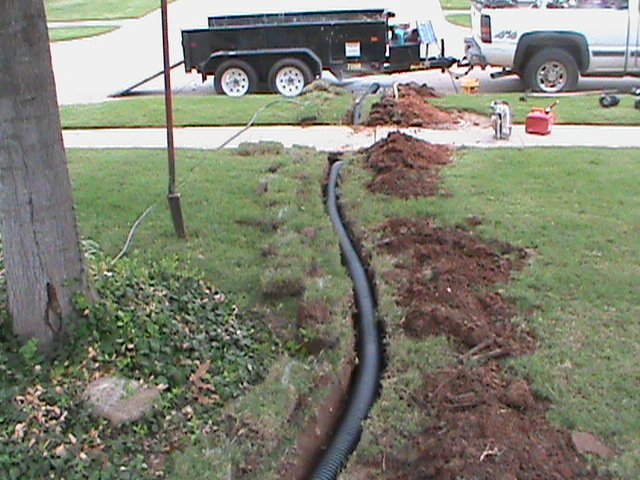 WHAT YOU SEE BELOW IS NOT A FRENCH DRAIN!